This is a flower tinker type toy that I forgot I had. Kids learn whether you want them to or not. Can you see the automatic sorting going on? Chicks and eggs.. one to one. Inch worms for measuring. These were EVERY WHERE today! 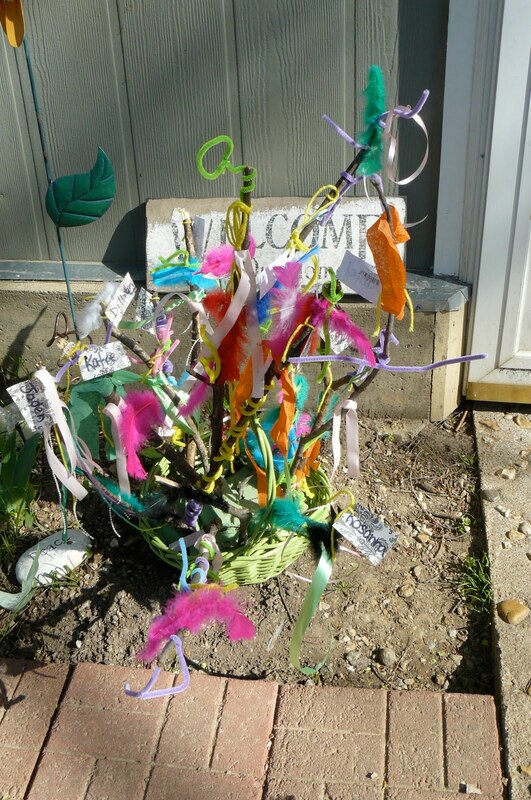 This is our SPRING STICK bouquet from yesterday. Isnt it beautiful? I plan to leave it outside the door to greet parents for a while. I think it just makes you happy when you look at it. Signs of Spring are everywhere. I freshened up the sign in area with some flower topped pens. Randy changed the bottle tree to the colorful display it is now. 1. 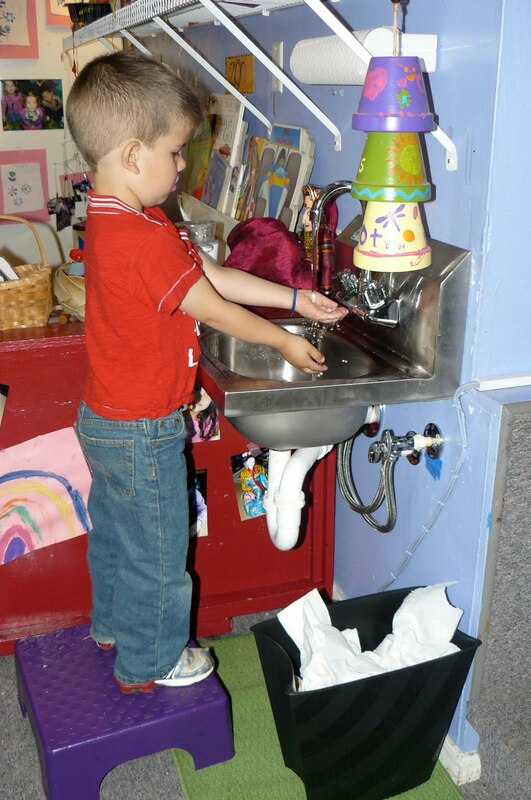 Do we use THIS sink after we potty or the one in the bathroom? 3. No room for automatic paper towel dispenser – learning to get one. 5. I need the cute sink skirt NOW.. I cant stand bear pipes showing. We will get used to it and then I know we will love it. The man in the picture is Frank, Whitlee’s grandpa. He is the one doing the work around the house this week. The kids have enjoyed watching him play with his tools. Life is good . The weekend is here. Randy and I are teaching and concerting at an Early Childhood Conference this weekend. I am teaching a class on BAS ( Business Administration Scale ) for family child care providers and Randy and I are teaching music and movement. I hate to say ” teaching music and movement” when really we throw a few ideas around that our friends can use but mainly we are having fun and singing! After that conference, one of the ladies that works for the state will be coming back to my house to do my BAS assessment. I know…. the weeekend, really? I offered. She is teaching a class at the conference and I didnt want her to make a special trip back to NW Arkansas. So, everyone get your running shoes on – this weekend will be a fast one. Try Aloe for the burn… helps take the sting out of the burn. I love the work your doing in the yard. What a great idea about the star… I bet Randy was right, the kids probably did love it. Also, we have the same lion towel… never thought to use it in the dress up area. We have a dinosaur too, I think I will have to get them out 🙂 Great Photos!!! I love Spring. We have thought about that. The first day the wind blew the vines off, so we have to figure out how to get them to stay… thanks for the input.